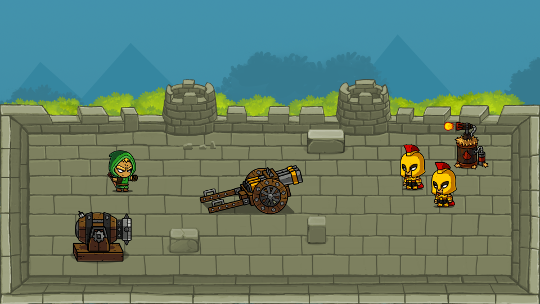 As the goblin invasion is in progress, the battlements are filled with dangerous war machinery. The castle guards are defending a siege and have prepared various weapons and traps for the invaders. You are intruding here, so prepare to deal with the guards and the hazards at the same time. The second level is meant to be more dangerous, but possibly shorter than the forest area playwise. You're walking around the battlements looking for a way to enter the castle insides. I have been quiet with adding new features to the game as I was preparing for the Steam release. Many bugs were fixed, netcode works properly again, and I made some changes to enable full controller support. That's right, now you can lean back and play it all with a controller, even stuff like entering player names and password codes for online multiplayer. The Glacier has been nerfed a little bit - the special Freeze All Enemies power is now magic based instead of rage based. It needs 2 mana bars to activate. It's still very powerful, but not game breaking anymore. I was a little bit conflicted about this change. Neither Castle Crashers nor The Binding of Isaac have those. But Rampage Knights has, and the combat feels better. You would rarely look at the health bar for enemy, but sometimes it gets important, esp. when you're dealing with bigger crowds - it makes it easier to pick those you can one-shot and remove from the battle. I understand some players might not like it, so it's optional. You can turn it off in the Graphics settings. I think it's a pretty nice game. I can't wait to play your game! lol awesome design on the ogre mom. He shows up randomly in the forest as an NPC and gives you a quest. Once you complete the quest, he will be unlocked and you can select him. And the game is now available on MacOSX and Linux. I can't say I like what I've seen so far from the game. But I would like to give you at least a bit of feedback instead of letting you in the rain. So don't get me wrong when what I say is not haw awesome it is what I've seen so far. I don't like the art style. That is definitively a matter of taste, but it feels a bit conceptless. On one side it looks with these proportions like it tries to be cute, but on the other side it has orcs in them being brutal. But their are also not very brutal, they seem more like they want to fondle you. The mechanics I've seen so far I have all seen already, so I don't understany why I should be exited about this game. Also I don't get why this recombination should be so great. I understand it isn't the game for everyone, so I don't expect everyone to get excited. 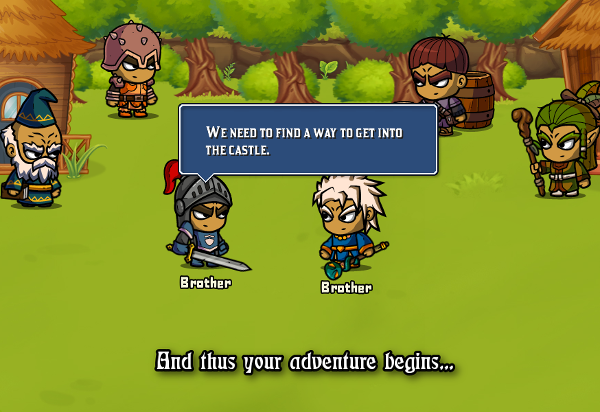 The game is made for people who have played through Castle Crashers and want more. 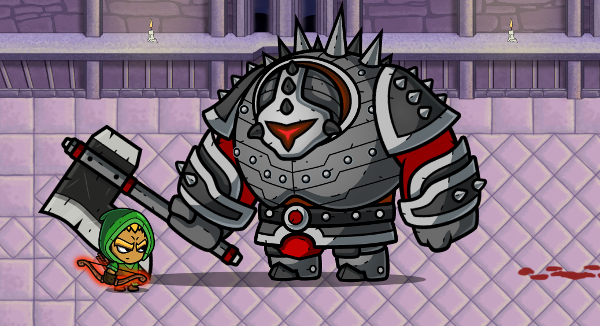 Castle Crashers gets boring pretty soon, because the game is linear and the bosses are sponges with a lot of HP. And magic / archery is very limited. 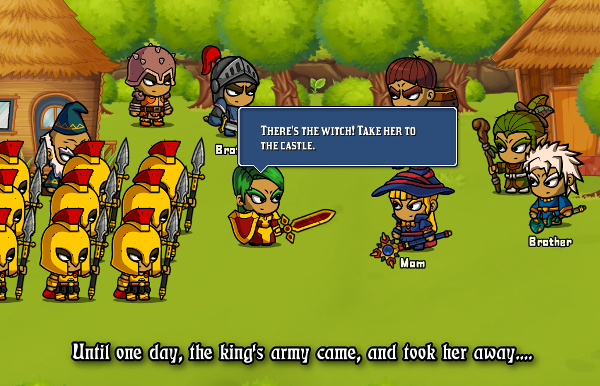 The point of this game is that it's roguelike and you can play it over and over again. 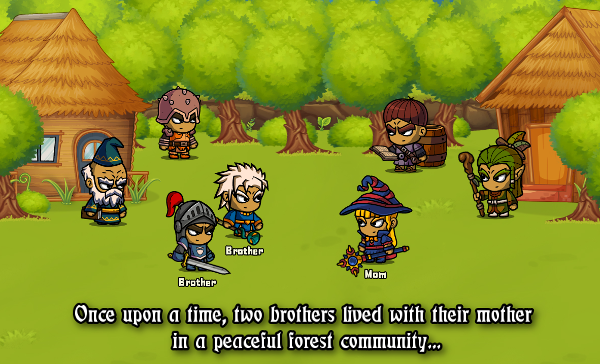 As you said, there's nothing new if you take any of the ingredients separately, but if you take it all together: there's no 4-player co-op fantasy beat'em up of this type. The goblins are storming into the castle. While the guards are fighting back, you are trying to get to the dungeon. 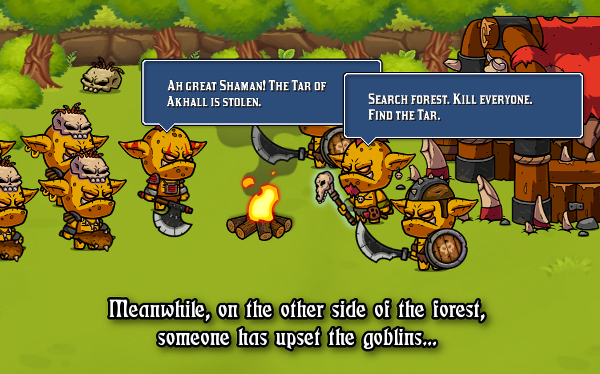 You need to go through the keep while the goblins and guards are both attacking each other and you as well. This gives you some interesting tactical options. Do you just evade them and let them battle it out before attacking the winner, or you try to help the weaker side to even out the balance of power. The next update will feature a new area with different graphics, background music and environment (traps, destructable items). 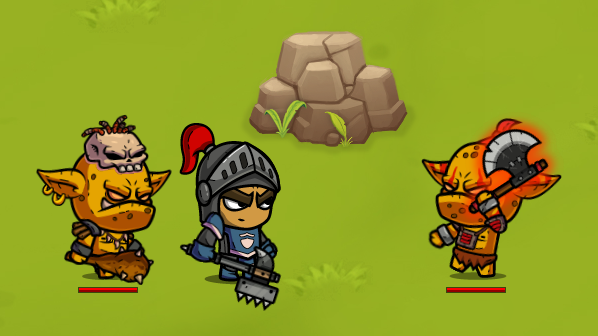 And a couple of new enemies and a new boss. 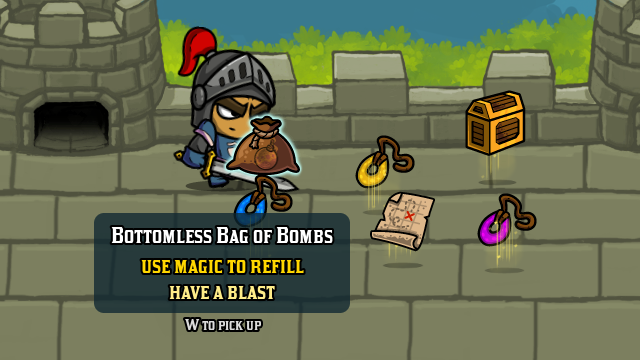 There's a reusable map, bottomless bag of bombs, and a magic chest that turns mana into gold. Beside those, there will be a bunch of pendants granting you immunity to fire, ice, poison and petrifying. The Run Like the Wind potion is removed from the pool because it was OP - a new amulet is introduced instead which gives you a permanent speed upgrade. The Overdose potion is going to be replaced with a Beer item, so that drinking unknown potions isn't so punishing. Fixed it. It will be in the next version. Thanks. It's called Thunderstriker currently. If you have an idea for a better name, please tell me. It has regular swing and overhead strike attacks and the special rage attack is to shoot a lighting bolt. The bolt doesn't knock down enemies, and does 25 damage/hit, so it can deal anywhere between 50 damage to lesser enemies to 125 damage to a boss. The shorter range of the special attack is compensated by the longer range of the sword (currently it's the weapon with the farthest reach in the game), decent damage and ability to shoot lightning through obstacles. Get an Infinite rage potion and have some fun. After a long time I come back. I actually played castle crashers, and I liked it really a lot. It is not only an entertaining game, it all the time completely exaggerated, so that the first time playing through the game it all seems ridiculous and a lot of fun. I can't see this exaggeration in your art style, it all seems to be generic with what I can see so far. I can't find the magical liopleurodon, or the laser raptor. I feel there is this special ingredient missing that makes this game look different from the other games. And there are a lot of side scrolling beat em up games for 4 players that you can play over and over again. Little Fighter 2 for example. Little Fighter 2 for example. It only has beat'em up, and lacks all the items, mechanics, pets, random dungeons, treasure chests, etc, etc. from My Mom is a Witch. And you can't really say that graphics are better either. The only game with similar feature set is Rampage Knights and it's two-player only. I don't see why are you so hostile. People make the games that look like other games all the time, that's how genres came to be. Not every game has to be revolutionary, esp. small games by one-man teams. Anyway, nobody is forcing you to play it nor follow this thread. My Steam sales show that there are definitely people interested in this type of game and I'm making the game for them.